As one of the internal Virgin Media people who trialled the Google migration for @blueyonder.co.uk addresses before we started customer migrations, I had to un-link my Google Mail account from my blueyonder one (so my BY account would fill up with e-mail) - I've been aggregating my blueyonder mail in my Google inbox so I can get used to the Google experience ever since we started our migration project. It's only this week that I remembered I hadn't linked them back up again - sorry to anyone I took ages in responding to accordingly! I've been on the Internet with my blueyonder e-mail address for 10 years now (and my Cable Internet one of the same format before that), and plenty of spam bots have harvested the address through years of helping out customers on newsgroups, forums etc. I always try to post with a valid address so that people who don't understand 'munging' e-mail addresses can still get through to me. 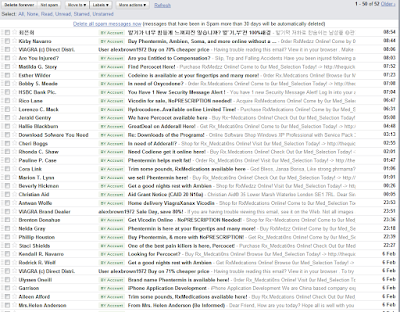 So, when I used Mail Fetcher to aggregate my mail I got a flood of e-mail - mostly spam - come through. I'm happy enough with that as a user, and it backs up my previous experience of the Google Mail spam filters, which are truly excellent. And I'd like to emphasise that I have never purchased or shown interest in such medical products!